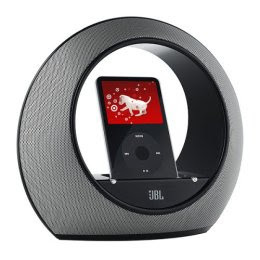 Out of all the variety of iPod speakers on the market, the JBL Radial series has one of the most stunning designs. The JBL Radial Micro Speaker is very portable and would be very perfect for small spaces like your office or a small apartment. The circular design is almost guaranteed to blend well with any décor. The JBL Radial Micro has a universal iPod dock adapter so it’s compatible with most versions of the iPod including the iPod Touch. A stereo mini jack is also included for compatibility with other devices such as MP3 Players, laptops, etc. The JBL Radial Micro has an included remote that gives you full access to the iPod. However, I wish JBL would let users access this device without the remote. There’s no volume controls on the unit itself so better keep your remote chained up. As for the sound quality, I have to say that it’s superb. Though not as powerful as its big brother, the JBL Radial Micro still delivers a pleasing treble range and midrange quality. Since the JBL Radial Micro is primarily designed for a small room, don’t expect to use this for parties as the sound gets a bit distorted when the volume is fully turned up. If you’re looking for iPod speakers for your bedroom or small office space, I highly recommend the JBL Radial Micro Speakers. For its aesthetics and sound quality alone, it’s definitely worth £ 99.99.